The U.S. Fish and Wildlife Service, along with other entities, recently released 27 paddlefish implanted with radio transmitters into Caddo Lake in an effort to help re-establish the threatened species into the Texas-Louisiana impoundment. Several hundred paddlefish, the oldest surviving fish species in North America, were part of the release, but just over two dozen were equipped with the surgically implanted transmitters designed to help scientists monitor their movements through Caddo Lake. Also participating in the effort were the Caddo Lake Institute, Texas Parks and Wildlife Department, U.S. Army Corps of Engineers, the Nature Conservancy, Northeast Texas Municipal Water District and the Collins Academy. Authorities said the fish were approximately 1-year-old and were 12 to 18 inches long. The Collins Academy is expected to work with schools in the region to use paddlefish as an educational instrument on natural sciences for youngsters. The recent release was a follow-up to two releases of paddlefish in 2014 by the USFWS and the TPWD. At that time, 47 paddlefish were installed with radio transmitters as part of Phase I of the program. The fish were tracked in the lake and in Big Cypress Bayou prior to the transmitter batteries expelling. According to a release from the Caddo Lake Institute, it is believed that paddlefish “fell into steep decline in the lake and its tributaries following the construction of an upstream dam in 1959 to create a Lake O’ the Pines. 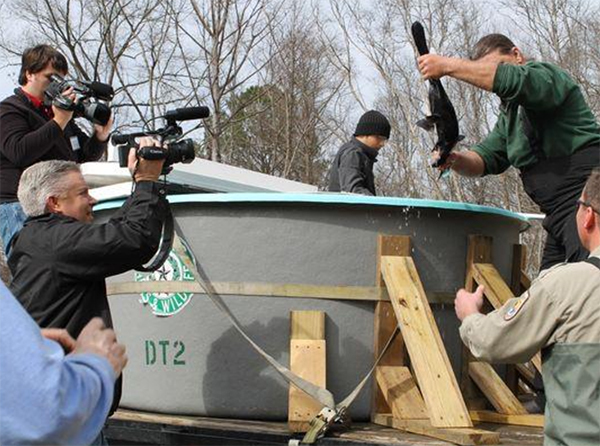 As part of this program, releases were made at the Caddo Lake National Wildlife Refuge, Karnack and Jefferson, Texas.